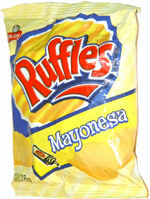 Taste test: These are narrow-rippled potato chips that taste sort of like mayonnaise. It's not a strong mayonnaise taste, and if it didn't say "mayonesa" on the bag I probably wouldn't have thought that they taste like mayonnaise, but I guess they taste as much like mayonnaise as anything else, and it's not a bad taste at all. I'd like it a lot more if it really did taste like mayonnaise, because I like the taste of mayonnaise. (If not for the social stigma and health issues involved, I could easily go on an all-mayonnaise diet.) The neat thing is that these are truly narrow-rippled Ruffles, the way Ruffles used to be in the USA before they widened the ripples a few years back.